Apple is making a major new product announcement today, likely a less expensive 7 inch iPad. They may also announce a retina version of the 13 inch Macbook Pro. Why is this significant? Well for me it is not so much the products they are planning to launch, but the location of the announcement. It's happening right here, in the California Theater in Downtown San Jose. Traditionally Apple has made product announcements from the Moscone Center in SF. With the remodel and expansion of the San Jose Convention Center, perhaps we can land future product announcements as well that require a larger space. Regardless of what happens going forward, today is a very good day for San Jose. The event starts at 10:00am, and many tech sites such as Engadget will be live-blogging it. 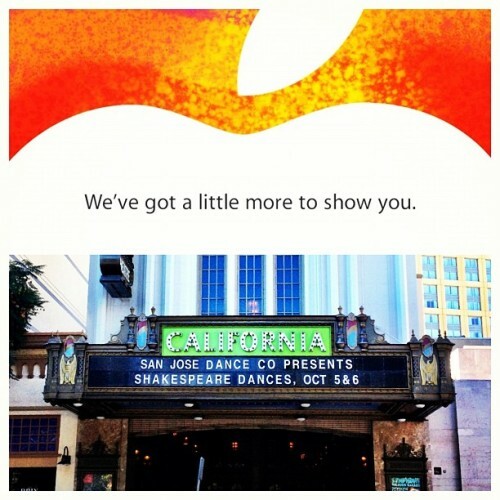 It's the California Theater today in San Jose, a venue Apple hasn't used in some time. It's absolutely beautiful in here, gilded columns and sweeping arches. Been watching some news videos of this event online. San Jose California! Nice product, but an even nicer venue that is the California Theater. I've always been critical of Apple not "staying home" and making product announcements here in the valley; instead choosing that smaller burgh 40 miles to the north. Having the iPad mini hatch right here in downtown San Jose is a definite breath of fresh air! Kudos to Apple for coming home! Hopefully DSJ is home to more product announcements in the future. It wasn't just the iPad mini, it was an epic event where Apple launched 5 (!) new products here, one of their largest announcements ever. Also on stage was the iPad 4, Retina 13inch Macbook, next gen iMacs, and the new Mac minis. Hope they continue to choose San Jose for future big announcements! I think it is great Apple launched their new mini iPad from our beautiful city. Thanks Apple!